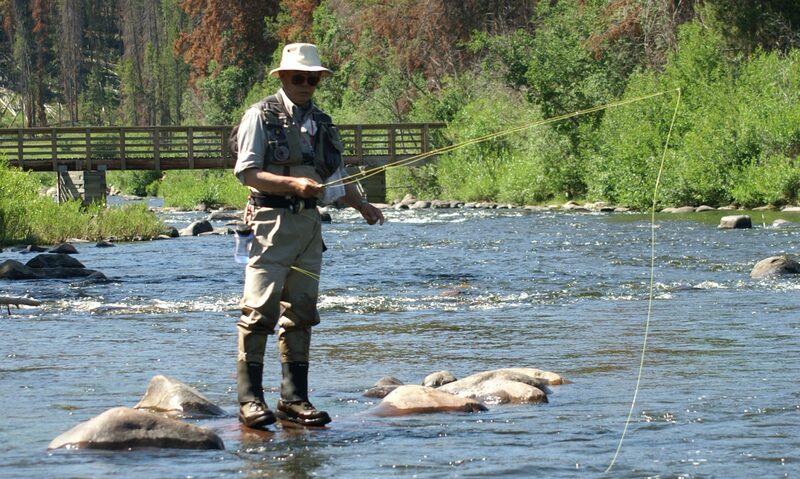 Rim replied, “This is why it is important to fish the fly upstream from the line. A straight upstream cast, or one upstream and across if properly managed, will allow the fly to travel in the same plane as the given current. You must position that cast to be in the same plane of current as the fish. The whole part of the line and leader, in or on the water, must be in the same plane of current. Otherwise, a faster plane of current will cause the line to drag across a slower plane of current. To counter this natural tendency for drag, you must mend to place the line and leader on line with the current plane the fly lands in. This will create the desired line of drift and then you must manage the line to ensure that the fly travels naturally within that current plane. “Strikes are more readily detected if the fly is upstream from the line. This is because the fly stops moving when a fish strikes it, therefore if your line which is downstream will immediately stop moving as well. If you fish with the fly downstream from the line, as many suggest, you will never see the subtle takes by concentrating on your fly line. By the time the line catches up with the fly, your opportunity will be missed. I’m often asked what do you use as the indicator then, is it detecting the strike by feel? No. It’s by sight, use the tip of the line (or leader if high sticking) where it enters the water, in place of an indicator. And free your flies from unnecessary drag and spooking of the fish below. I find your reasoning compelling and I’m going to give this approach an honest trial. To make sure that I understand, you don’t fetishize keeping the end of the fly line afoat, but let it drift under the surface of the water if the flies/weight/leader pull it under a bit. And, at other times, you fish with just the leader in the water. Am I right? I’ve seen a video of Rim fishing (it’s no longer available on the web) and he appears to keep a fairly tight line by letting it arc from the tip of the fly rod to the water. That’s the way I fish too, except with an indicator. So, now I will try losing the indicator. Thanks for the inspiration to try something new. I prefer to regard nymphing more as a matter of ‘focused attention’. To me, nymphing is more sensual than intellectual. My attention is focused, first, on obtaining a beautiful natural drift and, second, on detecting the strike. Provided a nymph fisherman can get beautiful natural drifts, he will get endless numbers of strikes. Trout will take his nymph on pass after pass. In fact, the very same fish will take the same fly again and again because a beautiful natural drift makes the artificial nymph look so real and tasty. The more difficult obstacle, therefore, to actually catching trout with nymphs is to identify all those recurring strikes. The vast majority of strikes go unnoticed because, drift after drift, they are far too subtle to impress nymphers of their presence. Yet every strike sends a signal. The real issue is to recognize how many signals are there. I like to compare the difference between a trout’s ordinary strike (streamer or Mepps spinner), in which a trout slams the fly or lure, and the ever so diminutive, delicate sucking action as the trout tastes the nymph to verify that it’s edible. The would-be nymph fisherman must radically adjust his expectation of what the signal of a nymph strike will be like. My best analogy is to imagine that you hold out your hands. To simulate the relative jolting impact of a streamer strike, I drop a 16-lb bowling ball into one hand. To illustrate the drastically reduced impact caused by a nymph strike, I drop a single goose-down feather into your other hand. It is possible to feel the feather, but not when you bring bowling-ball conditioning to nymphing. The would-be nymph fisherman must decrease his expectations by multiple orders of magnitude. With a sufficiently reduced expectation, the signal a trout imparts to the nymph and leader and possible strike indicator will become dramatically evident! The error is to look for the wrong kind of signal, gross in its evidence. Don’t expect the kind of strike signal you are used to in other forms of fly fishing. A nymph strike is NOT just a modest streamer strike! It’s qualitatively different. It’s entirely different! It’s every so tiny by comparison. If you are trying to detect bowling balls to catch trout on a nymph when the trout are sending you down feathers, you’ll miss their delightful game of tag. But attune yourself to expect and detect down feathers and you will recognize dozens and dozens of strikes everyone else misses. Great comment, which is dead right; however, we don’t often expect any feel the take (however slight it can be, which we certainly are in tune with as well) with this method of light line nymphing, especially with small flies. However slight the feel of the line may be, the visual aspect of the take is what can be detected first, often only subsurface. Obviously there is also the visual side of strike detection, which is equally as subtle as what you describe here for the visual aspects. Thank you for the post.